Mimolette Cheese for sale. Buy online at Zingerman's Mail Order. Gourmet Gifts. Food Gifts. We often desire the forbidden and this is a cheese that was born of that very desire. In the 17th century, King Louis XIV banned Dutch Edam cheese in Flanders, the northernmost region of France. 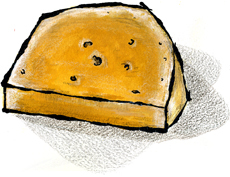 Missing the Dutch Edam, French cheesemakers reproduced it—but with a Gallic twist. They made the shape rounder, like a melon. And they added Roucou, known today as annatto, a natural red-orange dye from the seeds of the achiote tree, which made the cheese a bright orange color. Mimolette is mild in flavor but it does possess an intense nutty, salty and fruity flavor, like pineapple. While it can be eaten when it’s young, unlike Edam, it is best when aged over 12 months. We've selected wheels for you that are aged closer to 14 months. This cheese looks stunning on the plate with the deep orange color. It pairs very well with pale ales or rustic red wines like Cabernet Sauvignon and Quarts de Chaume.